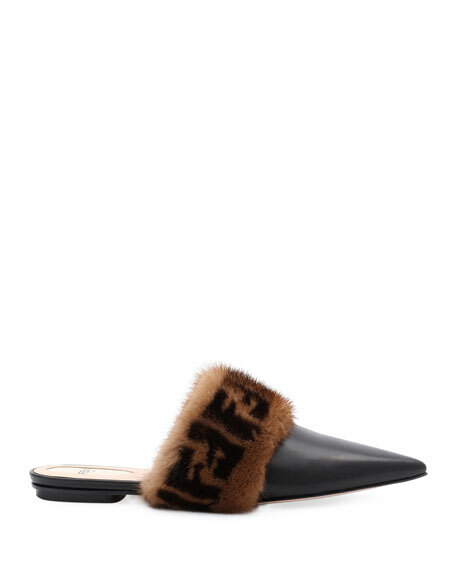 Fendi leather mule with FF-print dyed mink (Finland) fur trim. Balenciaga patent leather mule with metal "BB" logo ornament. 1.5" covered kitten heel. Pointed toe. Scooped collar. Slide style. Leather lining and sole. Made in Italy. Bottega Veneta mule in signature intrecciato woven napa leather. 0.5" flat covered heel. Almond toe. Notched vamp. Slip-on style. Leather lining and sole. Made in Italy. Sesto Meucci woven leather mule with suede trim. 1" flat heel. Reinforced round toe. Notched vamp with stretch insets. Cushioned footbed. Rubber outsole. "Galaxy" is imported.